Suddenly, it seems like the class is falling apart. Classroom routines that were going smoothly just a few weeks ago now seem rough around the edges. More and more children are forgetting to follow classroom rules. The noise level is higher, and academic productivity seems lower. What’s going on? In the weeks leading up to winter vacation, what you’re seeing may well be a case of the holiday season jitters. From November through January, children often become more fidgety, giggly, testy, and tired. There are many reasons: they may be distracted by the excitement of home activities, or they may be reacting to increased stress at home. At school, schedules are often disrupted at this time of year by assemblies, plays, and special events, and such changes in routine can throw children’s behavior off. Plus, at many schools, recess is curtailed once winter weather arrives. What can you do to help your students stay on track and learn at their best during this season? We’ve found that an extra measure of calmness, consistency, and structure can work wonders. Here are some strategies you might want to try. As much as you can, stick to the routines that you’ve established to shape the school day. For instance, if a daily Morning Meeting is part of your routine, you may find it’s even more helpful now. Starting off each day with Morning Meeting helps students make the transition to school through a welcoming experience that reinforces expectations for behavior and builds enthusiasm for the learning day ahead. You can use each of the four components of Morning Meeting strategically to help get the school day off to a good start. For instance, choose a calm greeting (such as a simple “Hello” passed around the circle) to settle the group if they seem especially bouncy coming in the door. Or use seasonally-themed sharing topics to help students learn more about each other. Choose sharing questions that every student in your class can answer comfortably. For example, questions such as What do you especially love about winter? or Do you enjoy any special holiday foods? don’t exclude children who don’t have vacation plans or who don’t celebrate holidays at home. 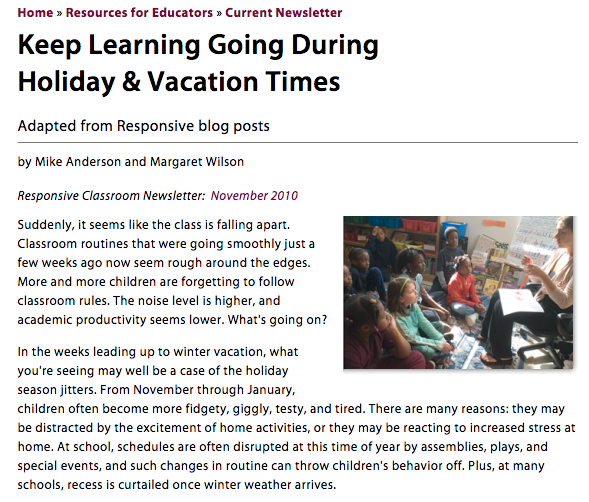 For more on how to plan Morning Meetings that will help with classroom management at this time of year, see Mike Anderson’s “Handling the Holidays” series from December 2009 on the Responsive blog. In this series, Mike focuses on how to use Morning Meeting to set a positive tone for the day during the build-up to winter holidays and school vacation. He writes about the four components of Morning Meeting in order: Greeting, Sharing,Group Activity, and Morning Message. When the inevitable deviations in routine do come up, let the children know in advance what to expect and reassure them that things will get back to normal. Remember that students learn by observing you: by handling schedule changes with good-natured calm and flexibility, you model that behavior for students. Look for opportunities to remark on children’s success in meeting classroom expectations. By giving children genuine information about their competence, you can prevent many behavior problems. Any time children are going off track is a good time to review behavioral expectations. When planning such reviews, it’s tempting to think about what the children “should” be able to do by now (It’s December—they should know how to sit quietly for sharing!). But it’s much more productive to keep your focus on what the children can do right now and what they need from you to help them do better. The Responsive Classroom approach to creating classroom rules is grounded in the idea that classroom rules help everyone meet their learning goals. So, after students revisit their personal goals, the next step is to reflect on the rules. Are they working? Do they need any changes? You might have the children rate how they’ve been doing with rule-following lately and then share your own observations. Be sure to acknowledge that it’s okay to need a brush-up; we all forget the rules sometimes, especially when we’re stressed or excited. For more ideas and resources on this topic, see Margaret Wilson’s “Revisiting Hopes and Dreams in the New Year” post from December 2009 on the Responsive blog. Plan for partner chats or “turn and talk” periods. Alternate active periods, such as science time, with more quiet periods, such as reading or writing. Weave in energizers to give children breaks without getting them too revved up. For example, you could play “Mirrors,” where students silently mirror or copy your movements, or sing a peaceful song together, gradually removing words so that everyone is quietly humming by the end. Engaging read-alouds can really help children focus and calm themselves. Look for extra opportunities to read aloud, just for a few minutes. Vary your selections among picture books, chapter books, and nonfiction books. Read from joke, riddle, and poetry books when you have an extra moment in the circle or while the children are lining up. Gauge the children’s energy level before choosing a reading. Choose a beautiful picture book or a quiet but moving story for times when you want to create a more calm atmosphere. Select stories that are especially inspiring, thought-provoking, or suspenseful if the class feels scattered and you want to bring them back together. Search for “read-alouds” on the Responsive blog to find descriptions of great books to read with students of all ages! It’s natural for children’s behavior to veer a bit off track during exciting or stressful times. During such times, observe your students, hold them firmly but kindly to classroom expectations, and make a few simple adjustments in your teaching practice. You can keep learning going while helping the children meet the challenges or enjoy the fun of the season. 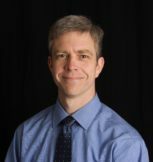 Mike Anderson was a Responsive Classroom program developer and the author of the 3rd-, 4th-, and 5th-grade books in the What Every Teacher Needs to Know K–5 Series, as well as The Well-Balanced Teacher, and the co-author ofThe Research-Ready Classroom. He has fifteen years of experience teaching third, fourth, and fifth grades. Margaret Wilson was a Responsive Classroom consultant and the author of several books, including: Doing Science in Morning Meeting (co-authored with Lara Webb); Teasing, Tattling, Defiance and More: Positive Approaches to 10 Common Classroom Behaviors; Interactive Modeling: A Powerful Technique for Teaching Children; the kindergarten, 1st-, and 2nd-grade books for the What Every Teacher Needs to Know K–5 Series; andDoing Math in Morning Meeting (co-authored with Andy Dousis).